This is a weekly feature about my friends who have met celebrities. I am going with some hockey-wrestling symmetry here. Please bear with me. Hockey season is back and that means Jim Cornelison is back. Nobody belts out the National Anthem like Cornelison. When the Hawks won the Stanley Cup championship, Cornelison got a ring. It is always wrestling season. Few people belt their opponents like Resistance Pro Wrestling's "The Ego" Robert Anthony. 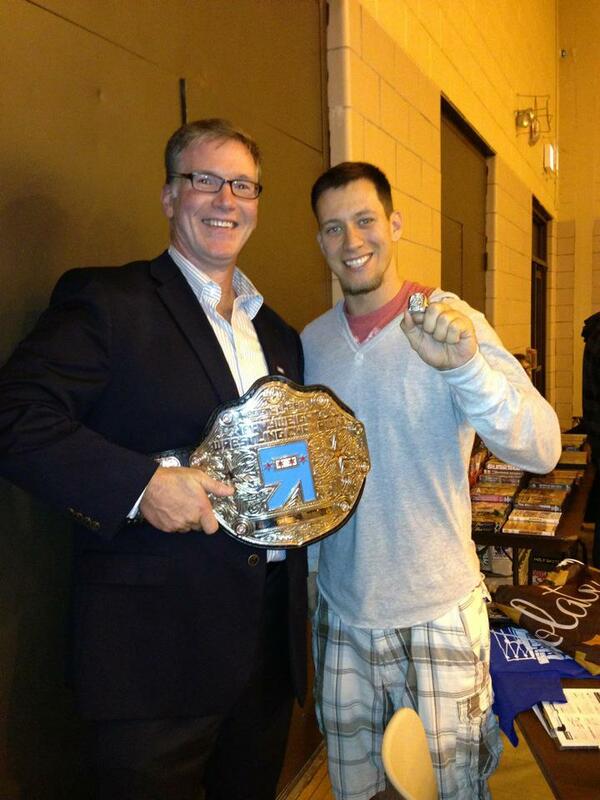 When he won the R Pro championship, Ego got a title belt. Both men are great at what they do. Both are popular at their regular events and as special guests at other events. Ego is a big Blackhawks fan and Cornelison is a wrestling fan. Their worlds crossed at a wrestling event last November. I happened to be at the same event and met both men. I love the photo below. I am pretty sure neither men knew I was taking their picture, but I saw a JohngysBeat.com opportunity and I took it. Two champs? How could I pass on this? As champ at R Pro, Ego has met lots of celebrities (or lots of celebs have met him). He is a great champ and I am always excited about seeing his matches. His next match at R Pro will be October 25 in Willowbrook, IL. R Pro's Welcome to My Nightmare promises to be a highly entertaining evening. Jim Cornilson and Robert Anthony in Melrose Park, IL-November 2012.